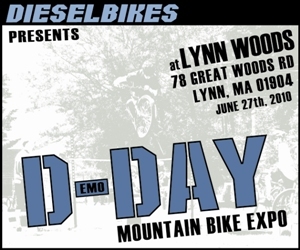 Below are downloadable forms & informational packets for this year's D-Day Mountain Bike Expo. Available downloads are in PDF format & will require Adobe Reader to view them. Expo 411 - Exhibits, Sponsors & Venues. will return to this year's D-DAY Expo! New stunts, new tricks and more Showtime. Tunebug delivers ultra-portable technology allows sound waves to pass through the surface your Tunebug rests on, turning many surfaces into flat panel speakers. In many situations, SurfaceSound can deliver a more natural sound than conventional speaker technologies. Stop by their booth to check out this product and meet Mike in the process. - Location: Lynn Woods Reservation - 78 Great Woods Rd. - Ballfield Parking Lot. Click here for directions. - Event Time: Open to the public at 9:30am and runs until 4:00pm. - Venue Music: Hosted by DJ "SHORTY-M40"
We are bring back our famous portable technical mountain bike stunts that every loves and will be adding a few more new TTF's for all to enjoy! Make sure you hang around for the Obstacle Course Challenge! Mike Steidley will be performing his trials stunt show presented by Kenda Tire and Haro Bikes. The first show will occur at 11:00am followed by the second show at 2:15pm. * Beginner Rides - Perfect for those who never rode Lynn Woods. * Touring Ride - New for 2010! Single 2.5 hour group ride; see what Lynn Woods Trails have to offer! * Ladies Only Ride - New for 2010! Hosted by HMBP! - Prizes for First [1st], Second [2nd] and Third [3rd] place! Each sponsor will have requirements for proper photo ID and completing waiver forms before riding or using any demo equipment. Individuals under the age of 18 must be accompanied by a parent or guardian with proper photo ID. Availability of demo equipment is on a first come first serve basis. What Is The D-DAY Expo? The D-DAY Expo is an event that will showcase the latest products, technologies and services in the fast growing world of mountain biking and outdoor sports! Our goal is to expose event attendees to everything that is mountain biking with an additional focus on other recreational activities in a fun and friendly outdoor atmosphere while we generate funds to support trail maintenance programs in Lynn Woods. 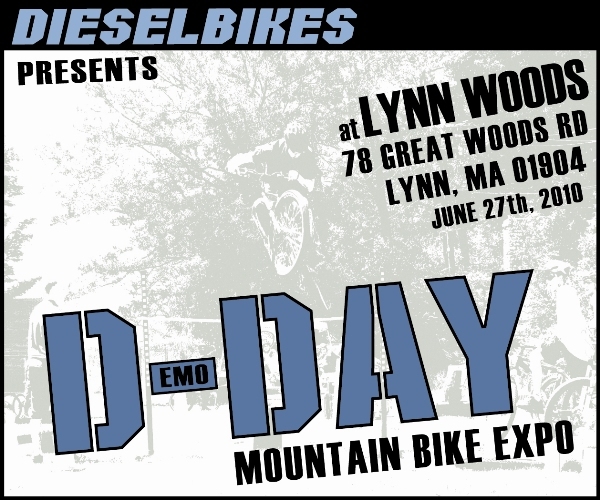 The D-Day Expo is an event designed for the mountain bike enthusiast & individuals who share a passion for outdoor recreational activities. Regardless you�re a beginner, weekend warrior or training for competition, this event will have something for everyone. Product demonstration, informational seminars, professional shows, rider skill clinics and contest all designed for the recreational junkie. Speak with industry representatives, compete to win prizes and ride some of the best technical trails local to the Boston area! The D-Day Expo is an ideal venue with a friendly family-fun atmosphere! It can inspire any mountain biker with countless ideas to enhance their skills, update their equipment and revitalize the passion for this sport! Don�t miss the 4th Annual D-DAY Expo! 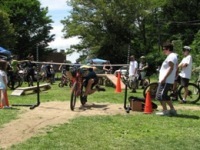 It�s one of the fastest growing mountain biking events in the Boston area!